The board game club was appropriated a goodly amount of money to spend on new games this semester, and today our shipment finally arrived. Behold! $400-worth of board games! I couldn't fit everything on the table, so I had to stack some games on top of others, obscuring the box art for Roads & Boats and Mare Nostrum. So, we have Ys, Hacienda, The End of the Triumvirate, Commands & Colors Ancients, Roads & Boats, Mare Nostrum, Antike, The Scepter of Zavandor, Masons, and Blue Moon City. Most expensive of the lot? Roads & Boats. By far. Roads & Boats cost $90 from Thought Hammer, which means that it costs about $135 from anywhere else. What do you get for that money? Rule books and scenario books in English and German, four bi-lingual quick reference cards, 1259 assorted wooden bits, cardboard chits, and glass beads, several dozen small baggies to sort and store the afforementioned 1259 assorted wooden bits, cardboard chits, and glass beads, a giant rolled-up sheet of plastic to lay overtop the hexagons you use to make the map, and one black erasable marker to draw your roads on the afforementioned plastic sheet. According to the box, the game takes about 4 hours to play. And if you can't find a friend, the game helpfully includes several solitaire scenarios. I honestly don't know that much about these games. Hopefully they're good; people on Board Game Geek seem to like them. 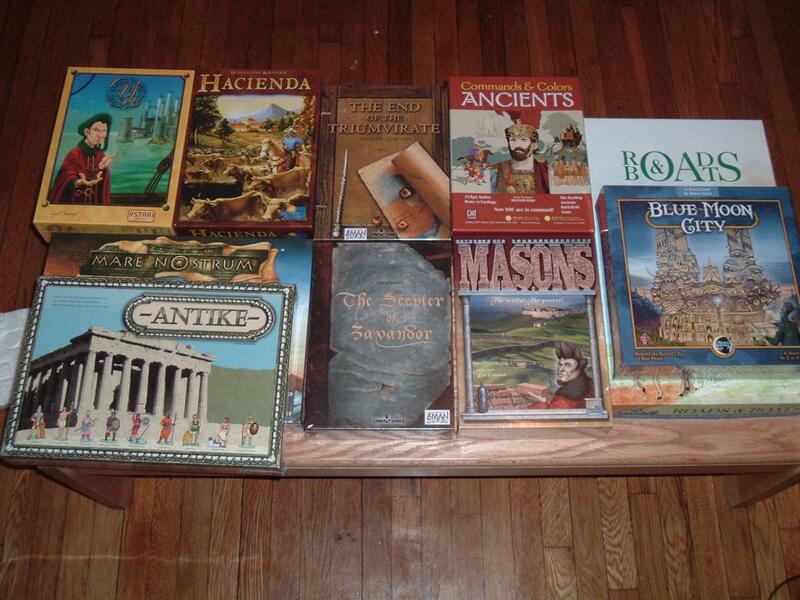 Theme-wise, of the 10 games we've got 4 Ancient World-themed games (Triumvirate, Command & Colors, Mare Nostrum, and Antike), 3 Fantasy-themed games (Ys, Blue Moon City, and Scepter of Zavandor), 1 Medieval-themed game (Masons), 1 New-World Farming-themed game (Hacienda), and one... um... giant transportation-themed game with no connection to any particular location or time period (Roads & Boats). Did you know that Jenna Fischer, the woman who plays Pam on The Office, is a big board game player? Her favorite game is Carcasonne. This page contains a single entry by Zach published on December 7, 2006 6:55 PM. Done with Classes! was the previous entry in this blog. Throw Your Life Away For Justice! is the next entry in this blog.